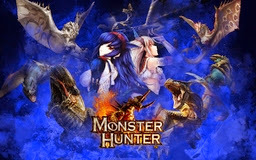 My new wallpaper is to a game I play this days, to Monster Hunter. 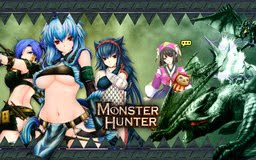 To be more concrete I play Monster Hunter Portable 3rd HD. OK, now more about the wallpaper. Some time ago I have come across Monster Hunter's female hunter images made by the artist Kizuki Aruchu (Official Page | Twitter | Pixiv), and I was thinking "Wow, the character design is totally great". Yes I know, the characters are originally from a adult doujin manga 'Monhan no Erohon' by the circle Udon-ya, but Arachu's art is really amaizing. So in this wallpaper I wanted to have characters by Kizuki Aruchu and monsters from the game, Nargacuga, Tigrex and some other... + top & bottom border and Monster Hunter logo in the center. I wanted to add something more from the game, so I decided to add the yellow bubble (it is mark that NPC want to talk to you. The girl with the bubble gives you the guild quests in the game).